If you’ve ever participated in any kind of canvassing for a political party or for pet causes, you know what an excruciating experience it can be on every level. From having to put on a cheesy smile as you approach busy strangers in the street to having to put all the information together back in the office, it’s just one of the most tedious tasks around, apart from, say, taking out the garbage. 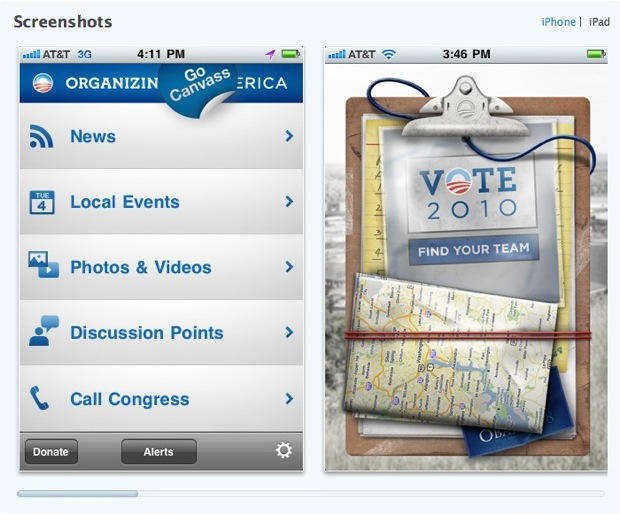 The Democratic National Committee and Organizing for America have gone a long way to address all of that with their thoughtfully-designed iPhone/iPAD/iPOD Touch canvassing and organizing application, which was launched earlier this month. It’s one of the best tools I’ve seen. If you’re out canvassing, the application provides you with the contact information for people who already voted supported for Barack Obama in 2008. So even though at this stage the individual may be a disappointed liberal or an angry independent, you have a starting point of conversation rather than having to use a lame chat-up line. It also allows you to take notes on your conversation, and transmits them back immediately to headquarters. And when you punch in your zip code, it hooks you up to all the local organizing events in your area — a crucial feature that enables volunteers to take immediate action. The essential point about the application is that it ties together news, action, video, and fund-raising capabilities all in one place in a device that you can carry around with you — and it all runs extremely smoothly, whereas the online tools on web sites can sometimes be clunky. Unlike some other political applications out there this election season, this doesn’t have trendy features (such as location-based applications) just for the sake of it. Everything in this app focuses like a laser on providing volunteers with opportunities to get involved in person at phone banks, in-person canvassing events, get-out-the-vote efforts and voter registration drives. The electorate’s mood in 2010 is obviously dramatically different than in 2008, and the Democrats are widely expected to lose control of the House. The party is going to need every persuasive volunteer and tool at its disposal to stem the expected electoral tidal wave. Money, and efficient organization with tools like this could just edge some Democrats over the top in closely-contested races.